Katana ZERO is the latest from developer Askiisoft, featuring fast-paced acrobatic melee combat in a dark neon-lit world. It's tough to take down a whole slew of bad guys on your own, but fortunately you have access to a drug called Chronos, which allows you to manipulate time, reversing your mistakes and slowing things down to the point where you can knock an enemy's bullet back at him. 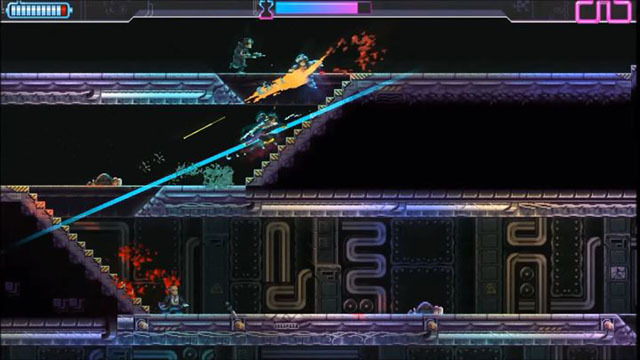 Players can dash and slide quickly through the environment, dodging lasers and getting behind baddies before slicing them into bloody shreds, and they can hop between buildings by extending cables between them for some ninja-style rooftop running in the dark of night. The game is now available on PC via Steam and Switch via eShop. Hell is Other Demons... ain't that a fact. Hannes Rahm is here to show you just how nasty Hell can be, as you blast hundreds of demons in the face with a huge array of weapons. 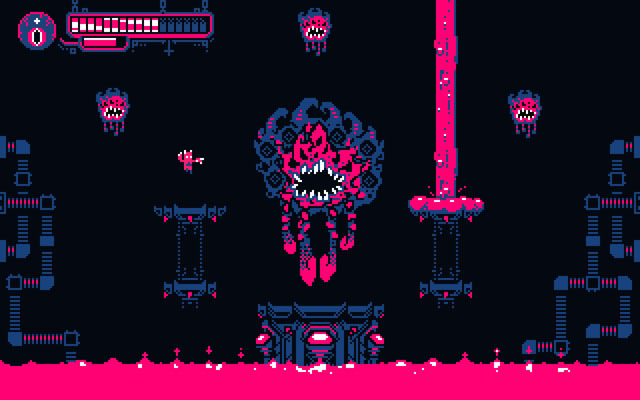 The game is a sidescrolling arena combat actioner in a 4-color palette that is continuously populated by waves of terrible demons waiting to milk your raging arsenal for its sweet hot bullet juice. As you destroy demons, and face off against terrible boss creatures, and keep your buns out of the burning lava below, you unlock new weapons and abilities to aid in your quest for destruction, and leaderboards await those who rack up a huge score. Plus, the tunes were composed by SoulEye, best known for the VVVVVV soundtrack. The game is now available for PC, Mac, and Linux via Kartridge and Switch via eShop. Rawal Rumble, from Anarkade, an 80's arcade-style beat 'em for up to 4P. The game takes place in Barcelona following a civil war that was ended after someone accidentally dropped a nuke near the airport. As a result, the people allowed themselves to be repressed and subjugated. 100 years later, a new force rises up to face this corrupt government, led by a foul-mouthed badass in a muscle shirt whose girlfriend was arrested, and he promises to make them "lick [his] big golden balls"... which is all you need to kick off a brawler. 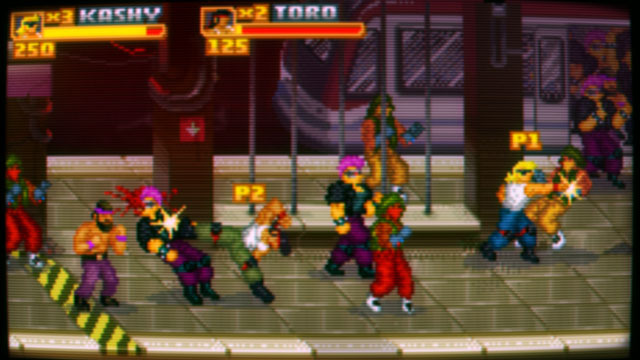 The game features the usual punches and kicks from the days of old - along with optional scanlines - but adds in considerably more crass humor and blood sprays. Players make their way through ten metropolitan locales, bashing faces, grabbing discarded weapons, and beating the stuffing out of powerful bosses with extended life bars. The game is planned for PC but does not have an announced release date. A demo is available on Itch.io, which includes one level and an unlockable survival mode. 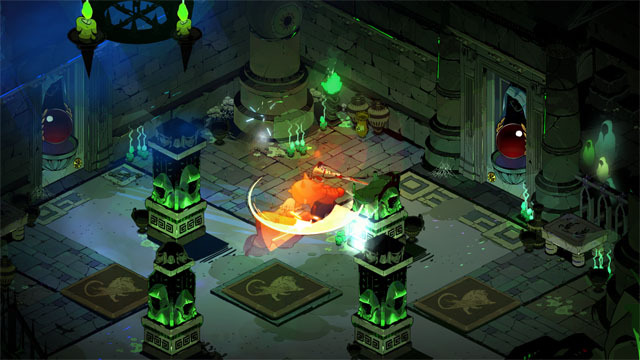 Supergiant Games is known for several top-notch action-adventure games, all with solid mechanics and gorgeous artwork, including Bastion, Transistor, and Pyre... and now they've returned with another beautiful action-adventure game with a single word for a title: Hades. In this game, you play the son of Hades as he defies his father and attempts to battle his way out of Hell. There's only one downside; dying just sends him back home. The game is a hack-and-slash roguelike that offers something new with each run. Players can attack hellish creatures with ranged and melee weapons, and supplement their abilities with perks that come in the form of divine assistance from Zeus and the other Olympian gods. The game is currently available for PC via Epic Store Early Access. Talegames presents Faeland, an action-RPG set in a medieval fantasy world. 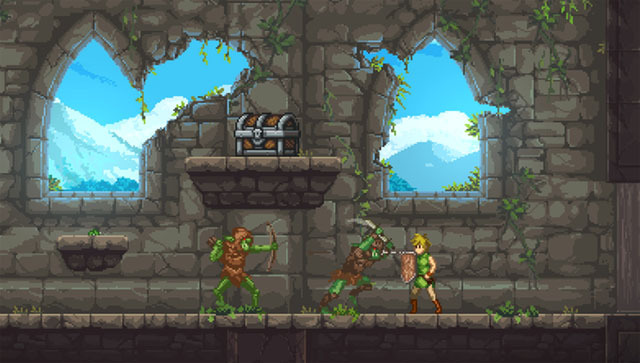 The game stars Sam, a blonde-haired boy wearing a green tunic who is able to wield a short sword, a shield, and a bow and arrows (remind you of anyone?). Sam is able to hunt for food in the wildlands, fight enemy creatures in dungeons, complete platforming challenges, learn new abilities to reach previously inaccessible areas, solve puzzles, and take on gigantic bosses. The game world is open, so you are free to travel from place to place, speak with NPC's to discover new information, and purchase new weapons, equipment, and health restoratives. The game is coming to PC, Mac, and Linux but does not have an announced release date.